Mike Bracken – Happy Birthday, We The People! Happy Birthday, We The People! September 27, 2012 by Mike Bracken. Average Reading Time: less than a minute. A year ago, the White House launched We the People, a new platform that allows anyone to create or sign petitions asking the Obama Administration to take action on a range of issues. 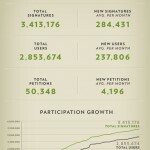 In just one year’s time, the platform has generated 3.4 million signatures by 2.8 million users. And what’s even more exciting is that participation is growing across the board — with more users and signatures every month. Read the full story on the Whitehouse Blog.